In a time when 5 inch screens are all the rage, the Galaxy Grand is Samsung's attempt to cater to every possible taste (and budget) when it comes to smartphones. While the Grand doesn't feature the 1080p screen that recent 5" flagships come with, nor the raw horsepower of the Galaxy Note II, it still has sheer size running for it. If you want a big screen at a low price, the Grand is the one to consider. Apart from the big display, the Grand does not have much which sets it apart from other midrange Samsung smartphones running the new SoC provided by Broadcom. 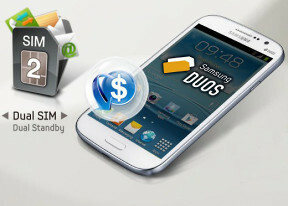 Like the just-released Galaxy S II Plus, it features 8GB onboard storage and a 1.2 GHz dual-core processor of the Cortex-A9 variety. RAM is also the same at 1 GB and the 8MP camera capable of fullHD recording probably uses the very same module. Even the screen resolution is on par with those two, so you can simply think of the Galaxy Grand as an enlarged Galaxy S II Plus. Of course, the picture changes completely if dual-SIM support is what you are after as the Galaxy Grand is the only one of the newly unveiled Samsung duo to offer that. The battery upgrade is not to be neglected either, although we'll only know if it translates to actual longer power autonomy when we get a proper review unit. The Grand is the only lower-midrange smartphone from a top-tier brand to offer a 5" screen alongside Samsung's very rich software package on Android Jelly Bean. It is, after all, a software experience that has been refined extensively over the past several years by the Koreans, and has played a big part in their current dominance of the smartphone market. Up next, we'll take a look at what sets the Grand apart hardware-wise, and how well the 5" screen handles the limited resolution. as per your review this smartphone supports MHL. Please provide specifications of the cable that was used to verify MHL support. my grand says it has 8GB internal memory but only shows 2GB.does upgrading the firmware have anything to do with it. ?